We are still about a year out on the next video game installment in the Witcher franchise, but that won’t be the only place you’ll be able to get some hot demon slaying action. 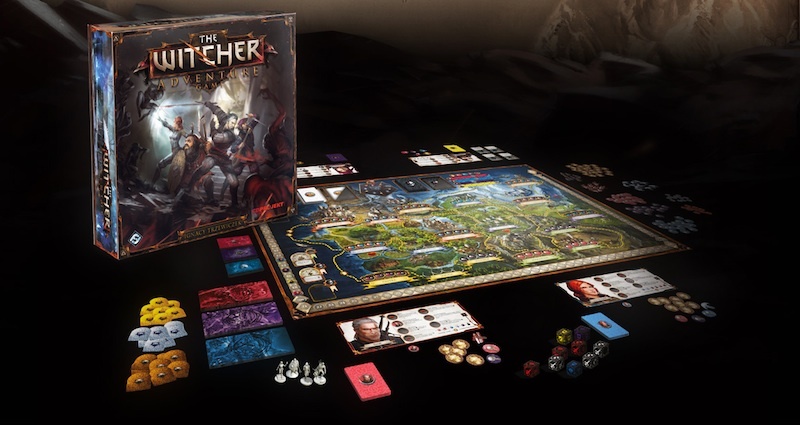 Soon to launch from Fantasy Flight Games and CD Projekt RED comes The Witcher Adventure Game. Each character has unique abilities and their own deck of Development Cards. As a result, each time you play you can discover something new by trying out varied characters and experimenting with different builds. For example, when playing as Geralt of Rivia, the main hero of the Witcher franchise, you can develop your character either by specializing in brewing and utilizing combat Elixirs, or else by growing your ability to cast powerful Witcher Signs. The designer, Ignacy Trzewiczek, has worked on past titles such as Stronghold, 51st State and Robinson Crusoe: Adventure on the Cursed Island, and it looks like TWAG is just as much focused on story as it is gameplay. Let’s hope that includes some RP elements within the gameplay itself rather than an opening dialogue and closing dialogue like some games (D&D board games, I’m looking at you). In any case, there will be 350 components that come with the game, so even if the game is no good, you’ll have had fun for an hour punching out little circles of hit points and whatnot. Now the bad news: as of yet there is no official release date, but you can fill out a form for pre-order information, if you are so inclined. Let’s hope that the game releases sooner rather than later because it actually looks pretty awesome.